Eastern philosophy has been trickling into the Western consciousness steadily since the 60s and has been gaining popularity ever since. But no matter the part of the globe, when it comes to the ancients things become less familiar. 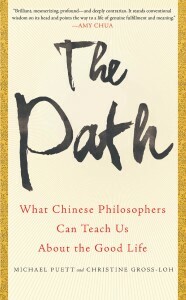 Michael Puett and Christine Gross-Loh aim to change this by educating readers about figures like Confucius, Laozi, Menicus, Zhuangzi, and Xunzi and what they had to teach. Giving us a brief overview of the time and place they occupied and a summary of their thoughts, The Path suggests these thinkers have the ability to improve your life. 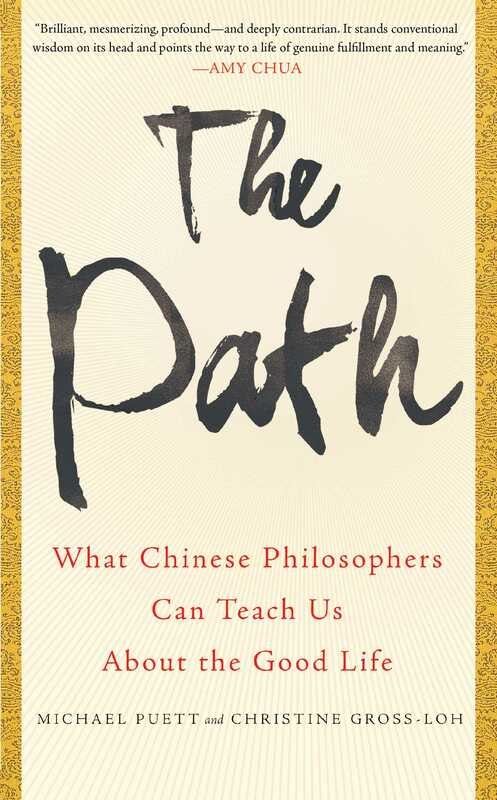 The Path’s first discussion is on the difference in thought between Confucius’ thought and our own regarding the orderliness of the universe. Puett and Gross-Loh claim that while we see the universe as generally ordered, the ancient Chinese saw the world as disordered and chaotic. This allowed them a certain resilience against the inevitable coming apart of plans and unpredictability of life and is also the reason that so many rituals were created and performed. Rather than taking the rituals of ancestral worship literally, The Path claims, these ancient practitioners knew that they were performing “as-if” it were literally true that their ancestors were watching over them, and that they were fully aware of this “as-if” quality. How this can possibly be known for sure is dubious at best resembling claims made by Karen Armstrong. A History of God, for instance, asserts that no one ever believed any holy book was ever literally believed and were always accepted as metaphor. This is dangerous conjecture, or at least presumptive, to comment on the mindset of long-dead people. Even so, it is interesting to think about how our own lives might be made better if we donned this attitude and performed our daily rituals as-if they were not tedious, or redundant. This could be very valuable in a “fake it till you make it” sort of way. By engaging with full awareness of the performative aspect of our lives, we might eventually find actual meaningfulness in ritual. It could be as Wittgenstein said, “…ritual is permissible only to the extent that it is as genuine as a kiss.” When imagining the simple, pleasurable and automatic ritual of kissing someone we love, ritual loses its unfavorable connotations and becomes inviting and welcomed. Perhaps more of our daily routines could be imbued with something like this feeling? Consider Annie Dillard’s line that, “How we spend our days is, of course, how we spend our lives.” While she was talking about writing, we can see that paying close attention to our daily lives, to the tedium, has complete consequence, either a wasted life or freedom. If ritual is treated as daunting, will that not affect our lives as we live them, as we look back on how we lived? Similarly, David Foster Wallace urges us to remember, “The really important kind of freedom involves attention, and awareness, and discipline, and effort, and being able truly to care about other people and to sacrifice for them, over and over, in myriad petty little unsexy ways, every day. That is real freedom.” Though never stated in The Path, ritual is an unavoidable and inextricable part of our lives. Comporting ourselves in the way suggested can actually have a real and lasting impact. After the initial discussion on ritual, The Path falls apart. It is contradictory in many places and wrong in others. For example, Puett and Gross-Loh discuss Rosa Parks and her arrest on the bus as a spontaneous protest and event, when it is the case that bus protests had been a strategy of the Civil Rights Movement and that Rosa Parks, for all her earned admiration, was purposefully selected. In another example: Puett/Gross-Loh paint Nietzsche as a fascist and also give an unsophisticated reading of the often misunderstood claim that “God is dead”. They reference the “will to power” as being tied to a divine being, a statement with no precedent and no citation. These concepts were covered thoroughly by eminent Nietzsche scholar and translator, Walter Kaufmann, in a book he originally wrote in 1950 called Nietzsche: Philosopher, Psychologist, Antichrist. Kaufmann’s book is well known in philosophical circles and it is the reason that Nietzsche is still discussed at all, rather than being regarded as a mouthpiece for the Nazi party. In it, the myth of Nietzsche’s fascism is totally dismissed, the Parable of the Madman in which “God is dead” first appears is given nuance and the will to power is expounded on at length. It is difficult to believe that Michael Puett, a Harvard professor and author of a philosophy book and Christine Gross-Loh do not have at least some inkling of this work. Puett and Gross-Loh are either ignorant, or make them with full knowledge of their wrongness. Neither of these options flatter the authors and call into question their claims about other figures. Unengaging and cursory in its approach, The Path does not motivate readers to dig deeper into unfamiliar territory. Without knowledge of the original thinkers, the claims made in The Path must be accepted uncritically. Between this failure, the brief, survey-like overview and disconcerting inaccuracies, one can read 85 pages of this book, where the discussion of ritual ends, and call it a day without a guilty conscience.